1 » No. 5/5 Florida Gators softball (43-7, 20-7 SEC) defeated the Auburn Tigers (31-5, 11-18 SEC) 9-1 in the first round of the 2010 Southeastern Conference Tournament on Thursday. Junior Stephanie Brombacher (29-5) took home the win, allowing two hits in five innings while striking out six. Junior shortstop Megan Bush and freshman Kelsey Horton each hit home runs in the game, and the Gators put together an eight-run fifth inning to put the game away. No. 2-seed Florida advanced with the win and will face No. 3-seed LSU on Friday at 3 p.m. in tournament semifinal action. 3 » Former Florida cornerback Jacques Rickerson, who was kicked off the team in November 2008 after an arrest for domestic battery, was arrested yet again Thursday afternoon and charged with cyberstalking and domestic battery by strangulation., according to The Gainesville Sun. Rickerson, a former four-star recruit, is currently being held in Alachua County jail on $45,000 bond. 4 » Taking a (really) early look ahead at the 2011 NFL Draft, ESPN analyst Mel Kiper went ahead and ranked his top five players available by position. Only two Gators made the list – senior center Mike Pouncey and junior safety Will Hill. Pouncey is ranked as the No. 3 center available even though he has yet to play the position for Florida; Hill is listed as the No. 2 safety and is expected to have an “official coming-out party” next year. 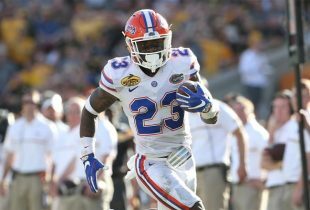 People will, when the talk of next year’s draft becomes relevent and meaninful rather than speculative and premature, revert back to talk of ‘ceilings’ and ‘potential’, but it is my opinion that Ahmad Black was and is the best safety on scholarship since Reggie Nelson left UF to make himself a bust at the next level.